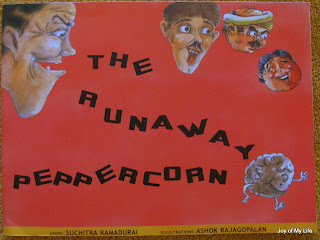 Like the Russian folktale The Little Round Bun, and the classic children's tale The Gingerbread Man, The Runaway Peppercorn narrates the delightful escapades of a charming little black peppercorn Kuru Molagu (in Malayalam and Tamil), that manages to run away one day. But, unlike the bun and the gingerbread cookie man who succumb to the wily fox, kuru-molagu manages to survive its adventurous getaway leaving us with a big smile and a sigh of relief. One sunny morning, in a little village in Kerala, Amminikutty Amma wakes up with a hankering for hot Dosas along with Ulli Chammandi (onion chutney). She gets the ingredients ready for the chammandi and finds that she only has one little black peppercorn. When she gets set to make the chammandi with the available ingredients anyway, our hero, the kuru-molagu, rolls off and falls to the ground and wakes up from his sleepy trance. When Amminikutty Amma tries to grab him back for her chammandi, he gets terrified and rolls away. Thus starts the adventures of the runaway peppercorn. The author, Suchitra Ramadurai, is a young and well-recognized radio and movie personality in Chennai, as I came to find out during my recent visit to India. 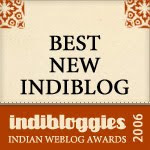 The book was shortlisted for the Commonwealth Short Story Competition 2003. The author set out to write this short story from her childhood, heard from her grandma who was apparently a great story-teller, but decided to present it for children in a non-patronizing way. The illustrations by the well-known Ashok Rajagopalan, who has been delighting children and adults alike for over a decade, set the tempo and capture the wee minds by complementing the story with an animated and easy-to-follow structure. Narration is very simple yet catchy, leaving us rooting for the little kuru-molagu as he rolls away to his freedom. The constant motion, the close-calls, the fast-paced nature of the animated peppercorn makes this a sure success with the little ones. And, the ending was on a thoughtful note: Next time you get set to make chammandi and one little peppercorn rolls away... just let it go. I fell in love with reading aloud ulli chammandi and chanda (market), chechi (sister) and chettan (brother) and such lilting malayalam words that only my dad uses on and off these days as he cracks us up with his funny anecdotes from childhood. Hearing Ana repeat those musical words, at least as approximately as her young and as-yet-untrained tongue allows, and hearing her Dad read it aloud with as close a diction as possible, makes this such a rewarding experience in our household. The only thing I would add to this book is a pronunciation key, which would work great for international readers like the Dad in our household. All in all a sweet little tale, nothing high-brow and fancy, no loaded morals except the suggestion to let that little peppercorn go if you see him roll away next time. Interesting review. I especially liked the last part about no loaded morals. I am slowly realising that many kids love books without too much of moral story attached to it. I thought we call pepper as just molagu in Tamil. (atleast that is what we say in our home :) ) never heard of kuru molagu though. is it malalayam? Thanks for visiting us here at saffrontree. My pleasure, O Lavish Dispensers of Praises! Thanks for telling me about the little fingerprinter. What fun! Just what young people should be doing: making creative messes! The review is awesome, I can't wait to get my hands on this one! We read it yesterday and it has been going non stop since then. I didn't know that Suchitra was Radio Mirchi Suchi!! We bought the full tamil version. My five year old who cannot read tamil, who can only identify the tamil uyir and mei ezhuthu was sitting with the book pouring over the book. This can only mean two things - she loves the story and LOVES the illustrations. I found that some words were in bold like damaal, sarrr-yendru, satt-yendru. I first thought that the onomatopoeia words are highlighted. But I also see words like 'arumayanna', 'thirumbi' also in bold. Any specific reason for that? How does the english version look? UBT, a kid who LOVES my illustrations is a great kid. Give her my regards please. @UTBT:: great question - i was trying to find a pattern to the font styles during our first few reads and failed; possibly a good question for the author/editor? It seemed like the action words were in bold caps at first - like bounced, swerved etc. that pertain to the kurumolagu, but, as you noted, it was not easy to pin down.